The discovery has been described by researchers as an "exceptional fossil"
A 435 million-year-old starfish fossil has been discovered in Conamara, Co Galway. The specimen will go on display at the Museum of Natural History in Dublin. It was discovered by geologist Dr Eamon Doyle in Maam Valley. Details of the find are contained in the latest issue of the Irish Journal of Earth Sciences, published by the Royal Irish Academy. 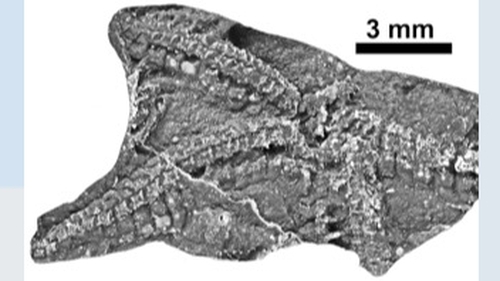 It is said to be a new species of an ophiuroid starfish, better known as a 'brittle star', which evolved around 500m years ago and have survived unchanged to the present day. The ocean that the starfish came from disappeared 400m years ago as a result of tectonic movements. The discovery has been described by researchers as an "exceptional fossil" that provides a key piece of evidence in the hunt for signs of life in an ocean that covered the country millions of years ago. The fossil was found by Dr Doyle when he was completing his PhD in Galway in the late 1980s but has only been analysed by experts now. The palaeontologist told RTÉ News that he had been searching for fossils halfway between Maam Cross and Leenane when he discovered a very thin layer of fossils on the side of a hill. The starfish fossil is about the size of a thumbnail. Dr Doyle said the species in question was remarkably resilient. It was on earth hundreds of millions of years before dinosaurs started to evolve and can still be found in the seas off the west coast today. In all this time, it has hardly changed, having adjusted ideally to living in its environment. It is not unusual for analysis of fossil samples to take a few decades. The testing on Dr Doyle's discovery was carried out by international experts, using his resolution microscopes to determine as much as possible about the find. It has been named 'Crepidosoma Doyleii' in honour of Dr Doyle.